Successfully Added Skylink - PoE IP Surveillance Camera (IR Cut-Off Filter, Nightvision) to your Shopping Cart. Skylink - PoE IP Surveillance Camera (IR Cut-Off Filter, Nightvision): make your home, office, and even the great outdoors safer with this advanced power-over-ethernet security camera! 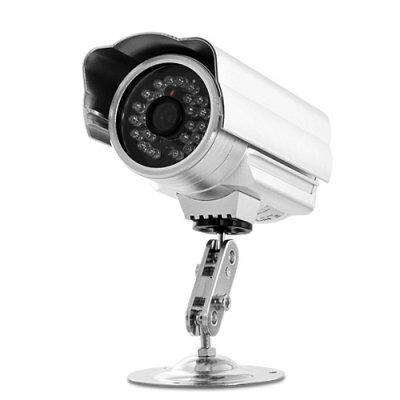 The Power over Ethernet (PoE) feature is what makes this IP Camera so special. It brings simplicity, convenience and efficiency by providing the Internet and power supply through a single cable! No more messy and inconvenient wires, no more reliance on a power supply in the middle of nowhere, just plug in the single Ethernet cable and you are ready to go! It is extremely easy to setup and use the Skylink IP Security Camera. Simply plug the PoE cable into a compatible router. Then install the program on the software disk. The program will generate an IP address for you. Copy and paste that IP address into your web browser and you can instantly view or record the camera's streamed videos - even if you're on a business trip at the other end of the world! Thanks to a CMOS sensor and an infrared (IR) cut-off filter producing more accurate color images , this IP Surveillance Camera delivers great clarity and image quality. This advanced combination of technology will help you see every detail so distinctly that you will easily identify people and recognize objects, even in environments with very poor lighting conditions. The Skylink is weatherproof meaning no matter rain, sleet, snow, you'll see and be able to record in any weather conditions. This resistant IP camera is able to operate during both day and night time with the support of 10 powerful infrared LEDs, allowing you to look out more up to 25 meters in near darkness! What more? Thanks to motion detection, when movement is detected, you will automatically receive snapshots of intruders in your email box, nice! This great PoE IP Security Camera is ideal for outdoor places such as gardens, terraces and parking. Order it right now while supplies last and receive it in a few days. All this is brought to you at a factory direct wholesale price by your reliable source of surveillance equipment and electronics, Chinavasion. Note: The PoE injector (adapter) is not included. To be able to use PoE function you need to buy a 5V DC PoE injector. Power over Ethernet (PoE): it means you can transfer data and charge the device from one source; basically you just need one cable. Haven't tested how weatherproof it is yet, but that is soon to come!